This past weekend I took my oldest daughter to Washington DC to visit my ailing father. While there we had lunch with one of my favorite people in the world, Helen Zughaib. 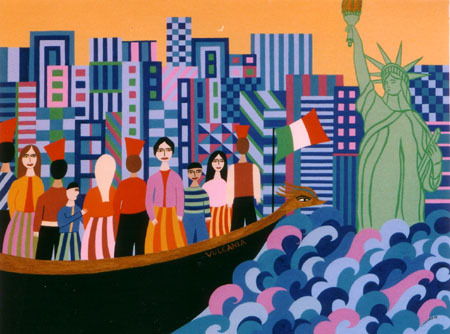 Helen is a Lebanese American painter who lives in a beautiful condo close to George Washington University, with stunning sweeping views of the Potomac River. Needless to say my daughter was awe struck by Helen, especially since she found out that President Barack Obama presented Iraqi Prime Minister Nouri Al-Maliki’s a gift of one of Helen’s paintings during his visit to the White House last year. The painting is called “Midnight Prayers” and it is an imaginative interpreation of her idea of tranquility and peace. Despite all that is going on in the piece, there is a sense of calm and contentment to it. 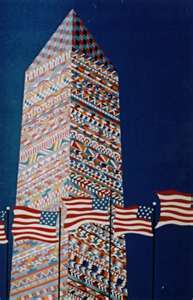 Helen’s rendition of the Washington Monument was also presented as a gift to King of Morocco Mohammed V1 from Secretary of State Hillary Clinton. Her work is in major collections all over the world, including the Library of Congress, the US Embassy in the Republic of Mauritius and the University of Bern in Switzerland. Right now she is working on a series called Arab Spring and while I don’t have any photos to share, all I can say is that it is astoundingly spectacular. 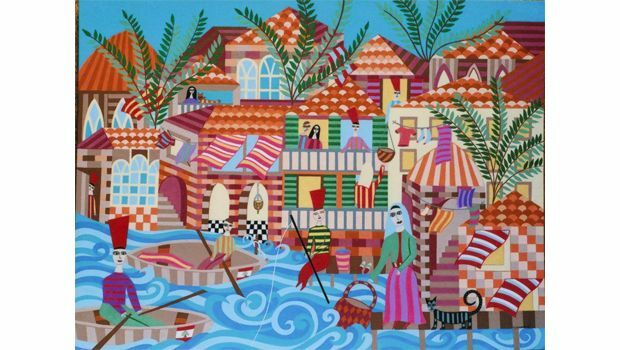 Her use of bright colours in her artwork makes it pleasurable to look at and brightens up any room or mood. I should know, I own three of her pieces and could fill a whole house with more. Every time I see her work, it evolves into something that is even more exquisite then the previous series. Just when I think I have a favorite piece, another pops up to happily replace it. Helen had just returned from a trip to Beirut for an exhibit and was busy working on another upcoming show. We were very lucky to catch a little of her time to share stories and amusing political gossip. She even let us in on a local tourist attraction that wasn’t very well known. She told us to go to the Kennedy Center for the Arts and head to the rooftop for panoramic views. It was very beautiful and on our way down we meet members of the Tunisian Symphonic Orchestra that had just left a rehearsal for a Monday concert in honor of the one year anniversary of the Tunisian uprisings. We walked along the Hall of Nations, noticed the Libyan flag was not yet corrected and named off as many countries as we could. It was a wonderful afternoon and a lovely break from the emotional drain of going home for a few days to see my father. It made me wish I had spent some time getting his stories of his life leaving Libya and coming to America too. I’ll be heading back to DC soon to see my father again, this time armed with a recorder and inspired by Helen’s series to capture the history of my own family.